Let’s talk about toughness. 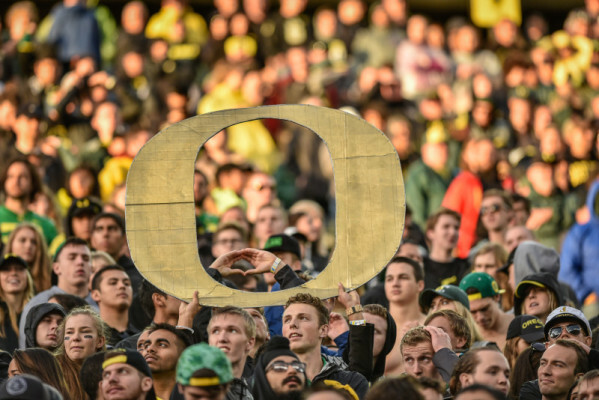 Since the beginning of the Chip Kelly era and the glorious run Duck fans have enjoyed over the past several years, toughness has always been one of the biggest question marks for Oregon football. Do the Ducks have what it takes to go up against a powerhouse program and win with hard-nosed defense and grinding offense when the speed, skill, and “gimmicks” of the no-huddle spread-option fail? For the most part, the answer to this question has been “No.” Most recently, Oregon was steamrolled by Ohio State in a national title game and run over by a more physical Utah team at home just a few weeks ago. It’s hard not to be disappointed after blowing a fourth quarter lead to the Cougars at home. And after blowing a 10-point fourth quarter lead at home against Washington State to drop to 3-3, it’s hard to ignore the program’s past indictments. It’s easy to cast blame on poor quarterback play and an inexperienced secondary, but it’s harder to swallow criticism of program culture and identity during those times when feels like the critics have been right all along. But for every shellacking by Utah at home, there has been a gritty performance that has flown under the radar. Although it ultimately still counted in the wrong side of the win/loss column, the loss to Michigan State in East Lansing earlier this season shows that these Ducks are tough. Vernon Adams has been sidelined with a broken finger since playing in that game, but he played and performed admirably in hindsight. Oregon nearly pulled off a win on the road versus a top-5 team that played its best football of the year that night. If there’s such a thing as a moral victory in a loss, that game was a pretty good example. We will learn a lot about the Oregon program as it faces a difficult remaining schedule in a down year. The rest of this season won’t be pretty. 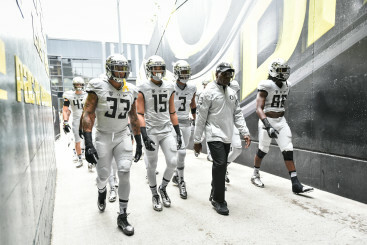 The remaining schedule is tough, and unless the Ducks show major improvement in the secondary and Adams (who is clearly Oregon’s best option at QB when healthy) miraculously comes back tomorrow with a healthy throwing hand and is firing on all cylinders, Oregon could be scrambling for bowl eligibility. Some may call for the firing Mark Helfrich (which I believe is premature and ill-advised). And questions about the legitimacy of the Oregon program post-Chip (and post-Marcus) will definitely be thrown around. However, I see the remaining six games as an opportunity to show the doubters and naysayers what this program is made of. 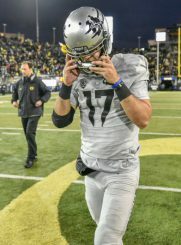 The way these Ducks finish the season will go a long way toward proving that while this year’s Oregon team may be down, the program is far from finished. 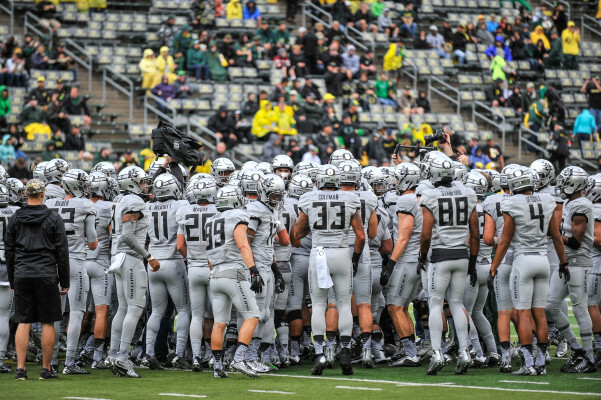 Oregon must move forward by reinforcing a culture of mental toughness, heart, and pride. There is a Greek proverb that goes something like this: “A society grows great when old men plant trees whose shade they know they shall never sit in.” The 2015 Ducks would do well to remember this proverb. This group won’t enjoy any shade this season. At times it may feel like they are the ants burning under the microscope of a cruel youngster. But if they show heart and toughness, the seeds planted by their efforts will grow. The young players and incoming recruits will emulate this culture of grittiness and resolve in the face of adversity. And soon, Duck players and fans will again be sitting in the shade that comes with championships and winning.